Dr. Akhilesh Gupta, Dr. Peter Carberry, Dr. Mangala Rai, Former Director General, ICAR (2nd right), and Prof. SK Dube, Chairman, DST CCP Expert Committee & former Director, IIT Kharagpur (5th right) launching the Center of Excellence on Climate Change Research for Plant Protection (CoE-CCRPP), supported by Department of Science and Technology (DST). 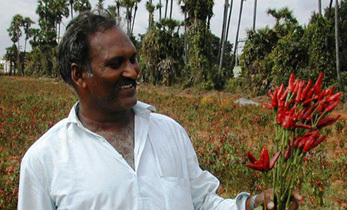 Hyderabad, 13 October 2018: Climate change, plant diseases and insect pests cause an estimated annual loss of US$ 8.6 billion, posing a huge challenge for smallholder farmers. 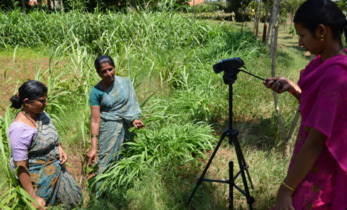 This is where the Center of Excellence on Climate Change Research for Plant Protection (CoE-CCRPP), set up by the Department of Science and Technology (DST) at ICRISAT, could make a difference. “Modern crop protection tools can make agriculture more sustainable and climate-resilient,” said Dr. Akhilesh Gupta, Adviser & Head, Climate Change Programme & SPLICE, Department of Science & Technology (DST), launching new activities of the CoE-CCRPP at ICRISAT today. Dr Mangala Rai, former Director General, Indian Council of Agricultural Research (ICAR) in his inaugural address, emphasized the need to critically assess potential impacts of climate change on insects and pathogens and their interactions with host plants. Development of a forewarning model to alert policymakers and farmers, real-time structured surveillance for insect pests and diseases using GPS-tagging, besides predictions on future climate scenarios for 2030 and 2050, are some new activities on which the Center will focus. Hot spots identified in the process and GIS-based risk maps (spatial and temporal) will be developed for targeted diseases and insect/pests. 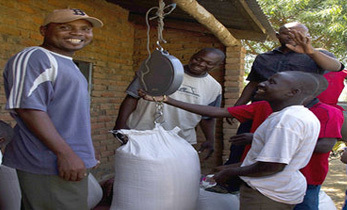 “Providing advanced information and tools is important to strengthen resilience of smallholder farmers. 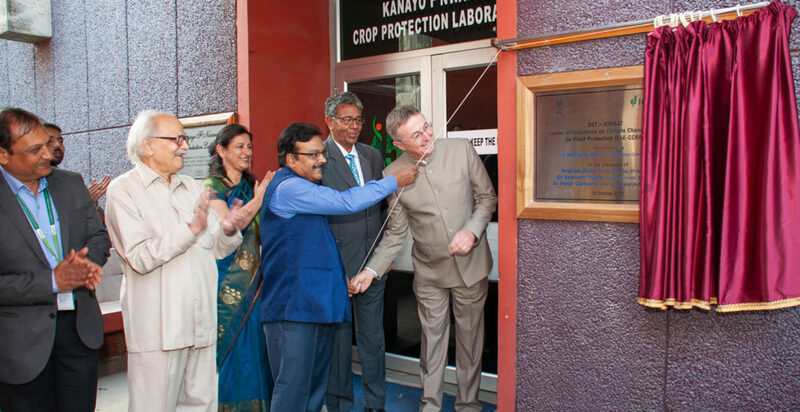 DST has taken several important measures in this regard and we are very happy to partner in this initiative,” said Dr. Peter Carberry, Director General (Acting), ICRISAT. 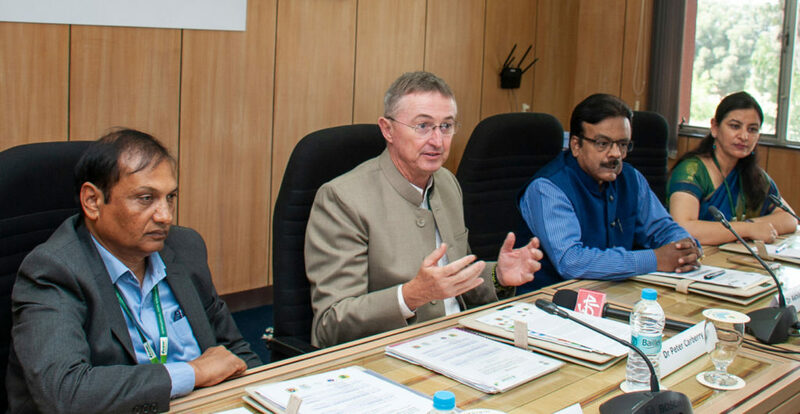 (L-R) Dr. Pooran Gaur, Dr. Peter Carberry, Dr. Akhilesh Gupta, and Dr. Mamta Sharma interacting with the media before the launch of new activities of Climate Change Research for Plant Protection (CoE-CCRPP), supported by Department of Science and Technology (DST). The Center’s results will be shared with policy-makers for efforts towards climate resilient agriculture. 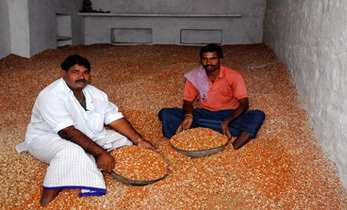 The Center consortium includes scientists of the Indian Institute of Rice Research; University of Agricultural Sciences, Raichur; ICAR-Indian Agricultural Research Institute; Punjab Agriculture University, Ludhiana; Tamil Nadu Agricultural University, Coimbatore; and CGIAR Centers. Current estimates of climate change indicate possible increases in global mean annual temperatures in the order of 1°C by 2025 and 3°C by 2100. 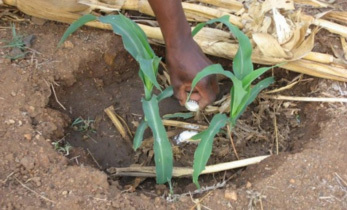 Coupled with variability in rainfall pattern and increase in global precipitation levels, this could result in new diseases/insect pests, increased risk of invasion by migrant diseases and insect pests and accelerated insect pest/pathogens development. “Research on these changing patterns in plant diseases and insect pests will induce shifts in the regional priority, strengthen location-specific crop breeding programs under climate stress conditions and help us identify climate-smart and pest-resistant crop cultivars,” says Dr P M Gaur, Research Program-Director-Asia, ICRISAT. According to Dr Mamta Sharma, Project Coordinator of this initiative, “The CoE-CCRPP will identify potential distribution of target diseases and insect pests under future climate scenarios at zonal, regional and state levels”. 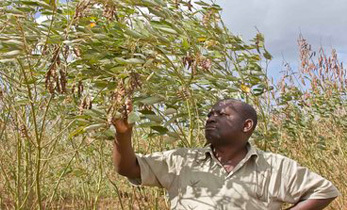 The CoE-CCRPP outcomes will be available for scientists and Integrated pest management (IPM) practitioners to develop country-specific strategies to ultimately support the greater resilience of smallholder farmers.